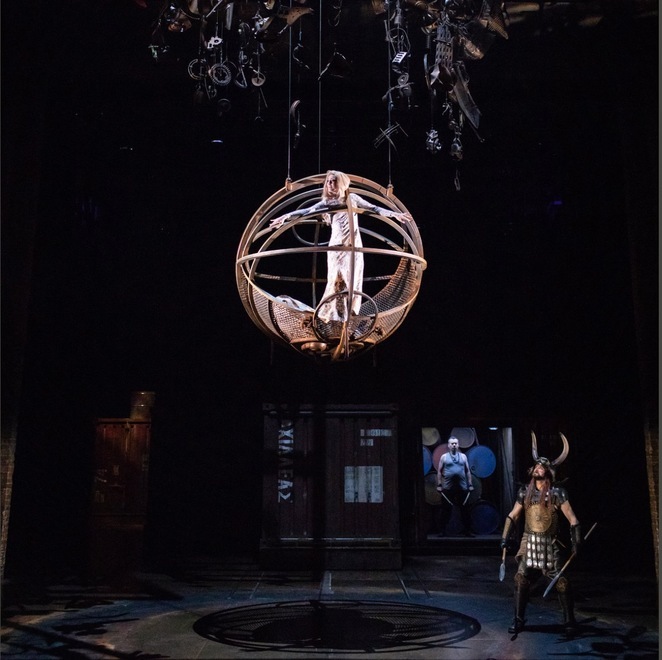 The Royal Shakespeare Company (RSC) Artistic Director Greg Doran is behind this new production of Troilus and Cressida that has plenty to resonate with modern audiences - from an enduring senseless war to a Mad Max style set. A motorbike roars on to stage to welcome the audience into a Troy at war with the Greeks. Rather than a sword and sandals drama, this feels more like a Mad Max movie. There's an apocalyptic feel of powerless to everyone's plight while skulls, leather jackets and helmets with horns and bug-eye goggles provide the aesthetics. This is the Trojan War revitalised by Doran for Troilus and Cressida, a play which Doran himself has described as "knotty, sinewy, teeming, challenging work". Based on a complex, uneasy situation, Shakespeare's work is not the most popular of his plays with changeable characters and a plot that challenges the status quo when it comes to heroes like Achilles. The story revolves around young Trojan lovers Troilus and Cressida as the War breaks up their burgeoning romance. This is set amongst the political backdrop of how the Greeks intend to win the War and the tensions rising in Troy as a happy-go-lucky Paris seems oblivious to the hardship he has put the rest of his family and city under due to his love for Helen. 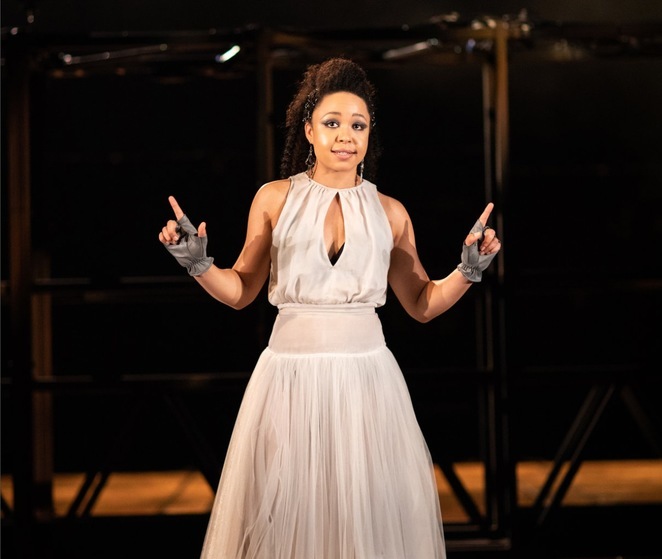 The almost dystopian set helps to create a sense of how the characters are caught up in a war with no way out; a war that tears apart lovers, families and friends as the seventh year of the siege of Troy gets under way. Doran focuses heavily on the comedy, which adds welcome zest and light relief into this complicated play. Around the love story sections, actor Oliver Ford Davies is used beautifully as Pandurus, the matchmaker between our young lovers. Davies sighs and coos in silly fashion along with making lewd jokes like an embarrassing inappropriate uncle. Characterisations are this production's strong suit. There's a hilarious running theme of Menelaus being treated as a dullard by everyone, and actor Andrew Langtree plays up to this in great pantomime fashion. Ajax is also portrayed as a mighty, strutting yet dim fool by the towering figure of actor Theo Ogundipe. Then there is hunky Achilles (Andy Apollo), whose every appearance is like a parody from an action film; a strapping bare chest and lover by his side. 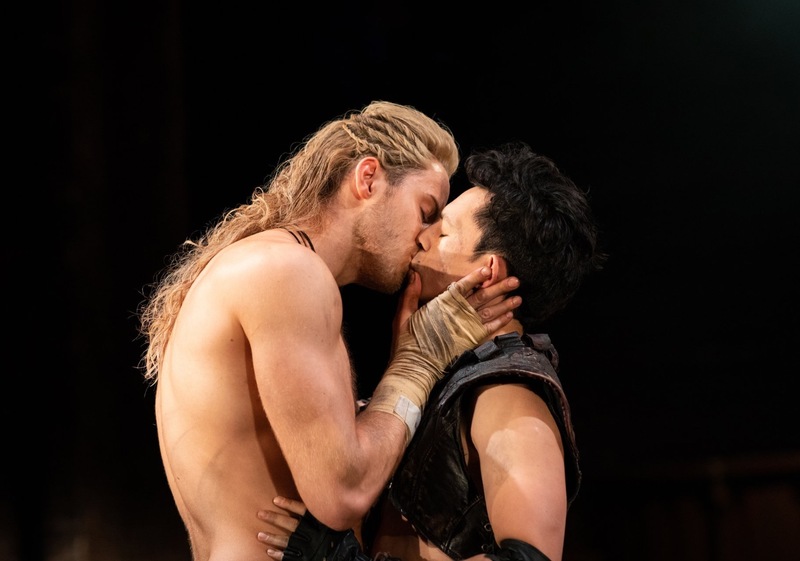 This version leaves no room for doubt over Achilles' passion for his male companion Patroclus. Then there's the famed lovers, Paris and Helen, who preoccupy themselves as amorous self-obssessed lovers, holed up in their love nest - a futuristic looking metal ball that descends from the roof. The real emotion of this production surrounds Troilus as he becomes hardened through war and heartache. Naive and love-struck at the start, he ultimately becomes brutalised and vengeful after witnessing Crssida's betrayal. Cressida has more of a cynical tough-edge and Amber James plays her with a sceptical canniness. There's an ambiguity around her betrayal to Troilus when she is forced to live in the Greek camp. It comes across as a way for her to survive with a protector among a gang of lusty Greeks rather than a flighty change of heart. The politics is heavy stuff and it's refreshing to see iconic lead roles performed by female actresses. 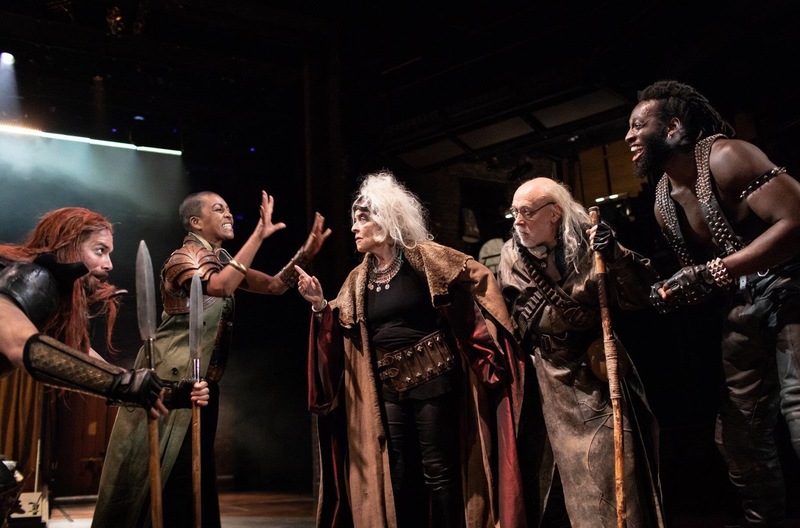 Adjoa Andoh is a crafty Ulysses while Suzanne Bertish is Agamemnon in the kind of outfit and hairdo reminiscent of Tina Turner in her Mad Max video for We Don't Need Another Hero. Talking of music, the soundtrack plays a key part in creating this dystopian scene. The stage doubles up as a soundscape with harsh drumming, sirens and percussion on oil cans, gong drums, a vibraphone and the like, in a similar fashion to the show Stomp. Virtuoso percussionist Evelyn Glennie is behind these raw sounds that lift the drama of the play to another level. As Doran acknowledged, this is a challenging play and not as easy to watch as Shakespeare's more renowned works. However, there's much to like about this stylish, new production. Doran has blown away the cobwebs for a fresh dystopian take on the plot which makes this a much more appealing, relevant drama to enjoy. 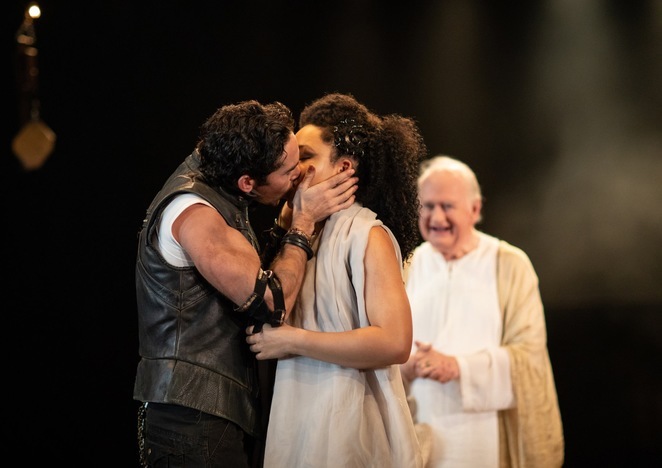 Troilus and Cressida will also be broadcast live from Stratford-upon-Avon to cinemas on 14 November.